Our weekly picks for Best iPad App of the Week are published here every Saturday. Check out all out picks below and you’ll soon have a collection of stellar apps for your favorite tablet. This week’s pick is Sunrise Calendar. Acquired by Microsoft in February, Sunrise has always been one of my favorite calendar apps because of its clean, uncluttered look and simple to use user interface. 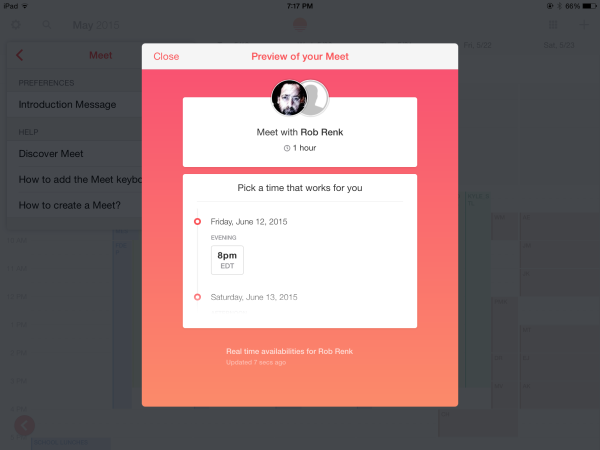 Earlier this week, Sunrise received an update with a intriguing new feature called Meet. 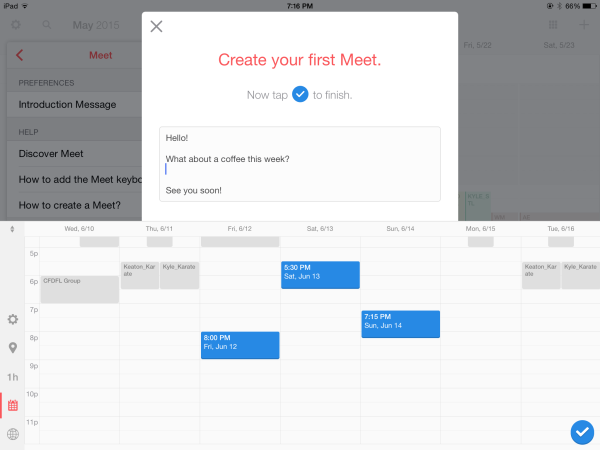 The premise of Meet is that you can now schedule one-on-one meetings with people with just a few clicks from within the calendar app. Available as a free update, the addition of Meet makes Sunrise an even more appealing replacement for Apple’s stock calendar app. Meet is actually an extension of the Sunrise calendar in the form of a keyboard–hence why your iPad needs to be running iOS 8. 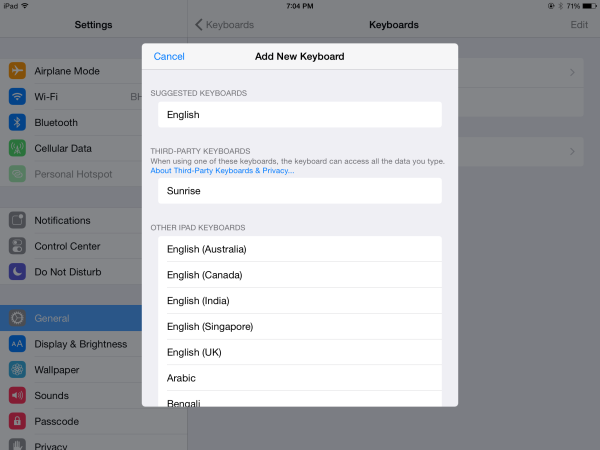 You add the Meet keyboard the same way you would any other 3rd party keyboard from the Settings App. • 100% free calendar app with a gorgeous design. • Compatible with Google Calendar, iCloud, Exchange. • A completely redesigned calendar experience for your iPhone and iPad. • Synchronization that just works, in real-time and with background updates. • Quick Add Event just by typing “Lunch tomorrow at 9pm” (long-press on the +) (for Google Calendars only). • Timezone Support. No more headache when traveling! • Facebook Events and Birthdays included. • See faces and profiles of people you are meeting with using LinkedIn. • Weather forecast based on your location. • Tag location to events. • Use Google Maps for Directions. • Connect multiple Google Calendars. You use the Meet keyboard to select an available clip of time in your calendar, which then send an email with a link to the person you would like to meet with. The recipient can then look through the available times you have selected, and when they make their selection, it is automatically added to both calendars. In a app category already crowded with competent apps, it will be interesting to see if the Meet keyboard feature will set Sunrise apart from the competition. 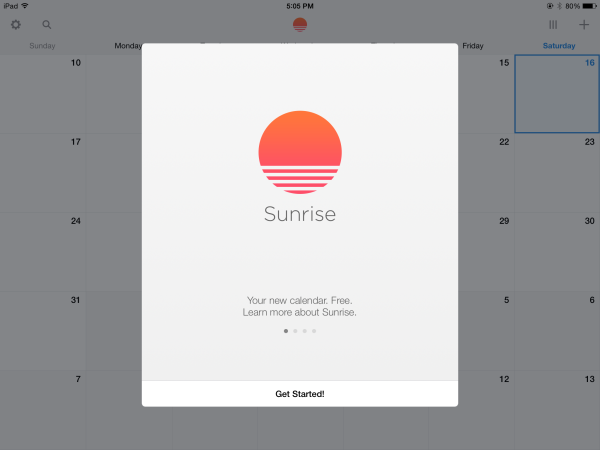 Here’s an App Store link for Sunrise Calendar; it’s free–so you really have no reason not to check it out. Besides, who doesn’t need an excellent, free, calendar for their iPad?